NCERT Solutions for Class 6 Math Chapter 7 Fractions are provided here with simple step-by-step explanations. These solutions for Fractions are extremely popular among class 6 students for Math Fractions Solutions come handy for quickly completing your homework and preparing for exams. All questions and answers from the NCERT Book of class 6 Math Chapter 7 are provided here for you for free. You will also love the ad-free experience on Meritnation’s NCERT Solutions. All NCERT Solutions for class 6 Math are prepared by experts and are 100% accurate. (i)	The given figure represents 2 shaded parts out of 4 equal parts. (ii)	The given figure represents 8 shaded parts out of 9 equal parts. (iii)	The given figure represents 4 shaded parts out of 8 equal parts. (iv)	The given figure represents 1 shaded part out of 4 equal parts. (v)	The given figure represents 3 shaded parts out of 7 equal parts. (vi)	The given figure represents 3 shaded parts out of 12 equal parts. (vii)	The given figure represents 10 shaded parts out of 10 equal parts. 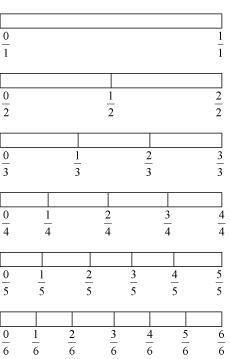 (viii)	The given figure represents 4 shaded parts out of 9 equal parts. (ix)	The given figure represents 4 shaded parts out of 8 equal parts. (x)	The given figure represents 1 shaded part out of 2 equal parts. Colour the part according to the given fraction. Identify the error if any. The given figures do not represent the fractions as here each shape is not divided in equal parts. What fraction of a day is 8 hours? There are 24 hours in a day. Therefore, 8 hours of a day represent . What fraction of an hour is 40 minutes? Arya, Abhimanyu, and Vivek shared lunch. Arya has brought two sandwiches, one made of vegetable and one of jam. The other two boys forgot to bring their lunch. Arya agreed to share his sandwiches so that each person will have an equal share of each sandwich. give one part of each sandwich to each one of them. (b) Each boy will receive part of each sandwich. Kanchan dyes dresses. She had to dye 30 dresses. She has so far finished 20 dresses. What fraction of dresses has she finished? Write the natural numbers from 2 to 12. What fraction of them are prime numbers? Natural numbers from 2 to 12 are 2, 3, 4, 5, 6, 7, 8, 9, 10, 11, and 12. Prime numbers among these are 2, 3, 5, 7, and 11. Therefore, out of 11 numbers, 5 are prime numbers. It represents a fraction . Write the natural numbers from 102 to 113. What fraction of them are prime numbers? Among these numbers, the prime numbers are 103, 107, 109, and 113. What fractions of these circles have X’s in them? Kristin received a CD player for her birthday. She bought 3 CDs and received 5 others as gifts. What fraction of her total CDs did she buy and what fraction did she receive as gifts? Out of 8 CDs, she bought 3 CDs and also got 5 CDs as gifts. Therefore, she bought and received CDs as gifts in a fraction of respectively. Also, all these fractions are equivalent. No, not all of these fractions are equivalent. figure represents a fraction . Hence, &mnSq2 can be replaced by 28. Hence, &mnSq2 can be replaced by 16. Hence, &mnSq2 can be replaced by 12. Hence, &mnSq2 can be replaced by 20. Hence, &mnSq2 can be replaced by 3. Clearly, both the fractions are equivalent. Clearly, both the fractions are not equivalent. Ramesh had 20 pencils, Sheelu had 50 pencils and Jamaal had 80 pencils. After 4 months, Ramesh used up 10 pencils, Sheelu used up 25 pencils and Jamaal used up 40 pencils. What fraction did each use up? Check if each has used up an equal fraction of her/his pencils? Yes, all of them used equal fraction of pencils i.e., . Two more fractions are . (c) Show on the number line. Put appropriate signs between the fractions given. Here, 1st circle represents 3 shaded parts out of 8 equal parts. Therefore, it represents a fraction . Here, 2nd circle represents 6 shaded parts out of 8 equal parts. Therefore, it represents a fraction . Here, 3rd circle represents 4 shaded parts out of 8 equal parts. Therefore, it represents a fraction . Here, 4th circle represents 1 shaded part out of 8 equal parts. Therefore, it represents a fraction . Here, 1st square represents 8 shaded parts out of 9 equal parts. Therefore, it represents a fraction . Here, 2nd square represents 4 shaded parts out of 9 equal parts. Therefore, it represents a fraction . Here, 3rd square represents 3 shaded parts out of 9 equal parts. Therefore, it represents a fraction . Here, 4th square represents 6 shaded parts out of 9 equal parts. Therefore, it represents a fraction . Here, the denominators are same. Therefore, the fraction having the greater numerator will be greater. Here, the numerators are same. Therefore, the fraction having lesser denominator will be greater. Make five more such pairs and put appropriate sign. Here, numerators are same. Therefore, the fraction having the lesser denominator will be greater. Here, the numerators are same. Therefore, the fraction having the lesser denominator will be greater. lesser denominator will be greater. As the denominators of are same, the fraction having the greater numerator will be greater. (c)	Here, the numerators are same. Therefore, the fraction having the lesser denominator will be greater. (e)	Here, the numerators are same. Therefore, the fraction having the lesser denominator will be greater. (e)	Here, the denominators are same. Therefore, the fraction having the greater numerator will be greater. (f)	Here, the denominators are same. Therefore, the fraction having the greater numerator will be greater. Ila read 25 pages of a book containing 100 pages. Lalita read of the same book. Who read less? Hence, Ila has read less number of pages. Rafiq exercised for of an hour, while Rohit exercised for of an hour. Who exercised for a longer time? Hence, Rohit exercised for a longer time. From both classes, an equal fraction of students passed in first class. (a)	Here, it can be observed that 1st, 2nd, and 3rd rectangles are representing 1, 2, and 3 shaded parts out of 5 equal parts respectively. Clearly, the fraction represented by 3rd rectangle is the sum of the fractions represented by 1st and 2nd rectangles. (b)	Here, it can be observed that 1st, 2nd, and 3rd circles are representing 5, 3, and 2 shaded parts out of 5 equal parts respectively. Clearly, the fraction represented by 3rd circle is the difference between the fractions represented by 1st and 2nd circles. (c)	Here, it can be observed that 1st, 2nd, and 3rd rectangles are representing 2, 3, and 5 shaded parts out of 6 equal parts respectively. Clearly, the fraction represented by 3rd rectangle is the sum of the fractions represented by 1st and 2nd rectangles. Shubham painted of the wall space in his room. His sister Madhavi helped and painted of the wall space. How much did they paint together? Fill in the missing fractions. Javed was given of a basket of oranges. What fraction of oranges was left in the basket? Sarita bought metre of ribbon and Lalita metre of ribbon. What is the total length of the ribbon they bought? Naina was given piece of cake and Najma was given piece of cake. Find the total amount of cake was given to both of them. A piece of wire metre long broke into two pieces. One piece was metre long. How long is the other piece? The length of the other piece of wire will be the difference of the lengths of the original wire and this piece of wire. Nandini’s house is km from her school. She walked some distance and then took a bus for km to reach the school. How far did she walk? Asha and Samuel have bookshelves of the same size partly filled with books. Asha’s shelf is th full and Samuel’s shelf is th full. Whose bookshelf is more full? By what fraction? Clearly, Asha’s bookshelf is more full. Jaidev takes minutes to walk across the school ground. Rahul takes minutes to do the same. Who takes less time and by what fraction? Hence, Rahul takes lesser time.